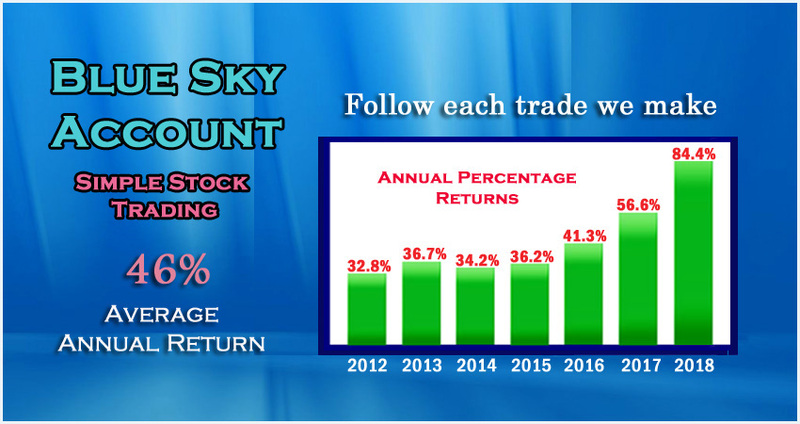 The OptionsWest “BlueSky Account” works to demonstrate the approach we take in running and managing a simple long stock trading account. Our strategy is to enter positions that are technically sound and then protect our profits. This strategy has a goal of compounding monthly returns to meet its objective of a 30% to 50% annual return on investment. This webpage is updated monthly to keep everyone apprised of the progress and status of the fund. See the historical annual returns and trade details listed below. The BlueSky Account currently has 27.0% gain through March of 2019. We can teach you this wonderful stratagem. You will spend 1-2 hours per day managing this account, that’s it!